It takes a lot to be part of Los Angeles’s crime scene time, in other words a strong stomach. This is one thing that new to the crime team, Web Goodhue doesn’t have. Web tries to tough it out as he really needs the job. Web gets approached by a woman who needs Web’s help to clean up a mess. 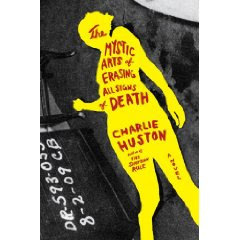 I so wanted to read The Mystic Arts of Erasing All Signs of Death after reading the summary. Unfortunately, I was very disappointed with this book. I didn’t even finish the book. In fact I started it and after only about twenty pages into the story, I put it down and read a few other books. I just came back to this book and tried reading it again and my first impression of it did not change. It was for lack of trying that I didn’t like this book. It was just that the story moved too slowly for me and the dialogic between the characters was too wordy. Yes, I enjoyed knowing details about the job and the crime scene but I didn’t need a step by step manual on every little detail both big and small. Who knows maybe some day I might pick this book up again and try finishing it. Not sure how far you got, but it takes a bit of a different twist about halfway through. I thought it was pretty good, it does start off a lot funnier than it ends. It was my first Huston so I'm not sure how it compares to the others, but I did think that it moved pretty quickly, for me anyway. I actually wanted more of the crime scene stuff. He's on it for about 2 days before stuff totally changes.